A new IZA World of Labor report looking at the US labor market (2000-2016) finds a remarkable drop in the labor force participation rate; the nearly full recovery of unemployment from the depths of the Great Recession; and the continuing growth in post-inflation average earnings while earnings inequality continues to rise. The report by IZA Network Coordinator Dan Hamermesh (Royal Holloway, University of London) looks at the development of the American labor market since before the 2001 recession. In the aggregate the US labor market is doing quite well today. 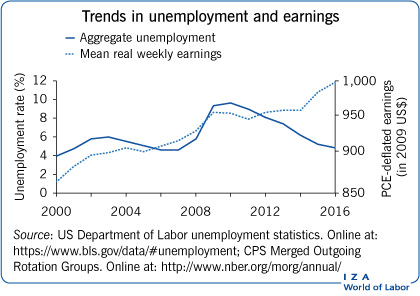 Unemployment is currently below 5%, and real weekly earnings of full-time workers increased from the 2000 cyclical peak to the current period of near full employment. The difficulties lie behind the aggregates. Teen unemployment at 15% is far higher than desirable, especially since it is coupled with the higher long-term unemployment among teenagers. It suggests that there is an increasingly large group who are beginning their work lives with long-term disappointment and with dim career prospects. Even though labor force participation rates of people aged 55 and over have continued to rise, those of adult men aged 20−54 have dropped, continuing a trend. Since 2000 the overall participation rate has fallen by over four percentage points. Surprisingly so too has that of women aged 20−54, sharply reversing the previous trend. This decline means that employment is about six million people lower than it would have been had the participation rate not fallen. Hamermesh argues that seeing a decline in labor market participation may suggest that Americans are developing a more reasonable work−life balance. Though post-inflation average earnings continue to rise, so does earnings inequality, with the growth in earnings most prevalent among workers in the upper half of the earnings distribution. The earnings of African-American and Hispanic workers relative to whites have not changed greatly and remain far below those of white workers. Hamermesh sees the continuing rise in earnings inequality as one of the biggest challenges in today’s US labor market. He suggests that the solution to this problem is simple and would put the US economy more in line with those of other wealthy nations. Since the labor market continues to generate increasing earnings inequality, its effects could be offset by tax policy affecting income inequality: The government should raise tax rates on households in the upper third of the distribution of household incomes while at the same time lowering rates on households in the bottom two-thirds. This is the first of a series of 27 articles written by labor and macro economists from different countries who summarize the current state of the central issues in their country’s labor market: Unemployment and labor force participation, overall and by demographic group; changes in real wages and wage inequality; and other country-specific labor-market topics. Find out more on IZA World of Labor!